.. or more precisely, how the New York Metropolitan Statistical Area (MSA) is changing. As of Census 2010 the New York MSA (officially the New York-Newark-Jersey City, NY-NJ-PA MSA) consisted of 20 counties. With the new OMB metropolitan statistical areas defined as of February 2013, the New York MSA became 22 counties, absorbing the Poughkeepsie, NY MSA two counties (Dutchess and Orange). The Poughkeepie MSA was removed from the official MSAs. The delineation remained that way until the new September 2018 delineations when the Census 2010 delineation was restored. Now, the Poughkeepsie, NY MSA exists as a 2 county area and the New York MSA exists as a 20 county area (both as they existed geographically in Census 2010). These metro-county relationships are shown in the graphic presented below. The Poughkeepsie, NY MSA is shown with the blue cross-hatch to the north and the New York MSA is shown with the salmon color pattern. – view developed using the CV XE GIS software and related GIS project. – see the related New York Metro Situation & Outlook report. A lot! First, during the interim period 2013-2018, the Poughkeepsie, NY MSA lost the metropolitan area identity/status as conferred by the OMB delineations. It might have been omitted from size class market development and research analyses. Related, that metro was not included as a tabulation or estimation area of MSAs by Federal statistical agencies. An example of the impact is that the official demographic estimates for the Poughkeepsie, NY MSA developed by the Census Bureau were not tabulated as such and omitted from various statistical reports. Also, the removal of designation and now adding the designation back, creates a hiccup in the time series — affecting both the Poughkeepsie NY MSA and the New York MSA. .. click link to view profile. The September 2018 CBSA delineations define counties that will be used for Census 2020 (likely, there could be yet further changes) — 384 MSAs in the U.S. In the cases of the New York MSA and the Poughkeepsie, NY MSA, it appears that the geography (component counties) used for Census 2010 will be the same as for Census 2020. Going forward, ProximityOne estimates and projections will use the most current vintage of CBSAs. Understanding the demographic-economic landscape for small area geography and how it is changing is vital for many stakeholders. Businesses and other organizations need to know how their market/service areas are changing … getting answers to questions like knowing about recent trends, where we are now and the how/where/how much things might change in the future. The following view shows census tracts (black boundary) located in the northeast Houston, TX area. Tracts are labeled with 2017 population estimates and percent population change from 2010 to 2017. Tract geography and characteristics are shown in context of three cities/places — Houston (orange cross-hatch), Humble (blue) and Atascocita CDP (green). It is easy to see what census tracts intersect with what cities and where. The pointer/hand is located in census tract 48-201-240902, partly intersecting with Humble city. The tract 2017 population of 12,984 reflects an increase of 10.4% since 2010. The dark brown bold boundary at the top of this tract is the Harris County, TX boundary. .. create views like this for any area in the U.S.; add your own data. TractWatch tells us which tracts in a region of interest changed during the past year based on quarterly observable data with only a one quarter lag. TractWatch is a new tool/service focused on examining recent demographic-business change for each census tract. These approximate 74,000 geographic areas cover the U.S. wall-to-wall and averaged 4,000 population as of Census 2010. Tracts have a generally stable geography between decennial censuses and are coterminous with county boundaries. Tracts cover the U.S. with more than a 2-to-1 ratio compared to ZIP code areas (see tract-ZIP relationship table). TractWatch insights are developed through the use of the ProximityOne Situation & Outlook (S&O) database and information system — a part of S&O demographic-economic estimates and projections developed and updated annually. The 2017 vintage tract estimates and projections (annual data) cover the period 2010 through 2022 (5-year projection). As a part of the S&O annual estimates and projections development, a range of measures are updated quarterly at the census tract level. Quarterly data are developed that include population, housing units, vacant units, households and business establishments. There is only a one-quarter lag in the availability of observable census tract data. For example, observable 2017Q1 data can be added to the S&O database in July 2017. Data are analyzed and converted into a TractWatch national dataset. The Situation & Outlook Reports (S&O Reports) are updated weekly, for the U.S. and each county, metro and state. TractWatch is a part of the “Recent Change and Outlook” S&O Report section and updated quarterly. See schedule of updates the shows when TractWatch is updated. The S&O Reports (metro and county) Recent Change and Outlook section includes a list of census tracts which have shown significant change over the past year for that geography. A table of typically 10-to-25 key tracts are listed in a table with selected demographic-business change attributes. .. examining how is the Appalachia population changing and why .. Appalachia is a region that includes parts of 13 states and has long been challenged with poverty. The population of Appalachia increased from 25,184,339 in 2010 to 25,449,932 in 2015. The extended report below, developed using the ProximityOne Regional Data Analytics tool, in combination with GIS tools provide insights into why, how and where the population change has occurred since 2010. Appalachia counties are shown in the following graphic with the black bold boundary. The thematic pattern map shows how counties have gained population (blue and green) and lost population (orange and red) during the period 2010 to 2015. 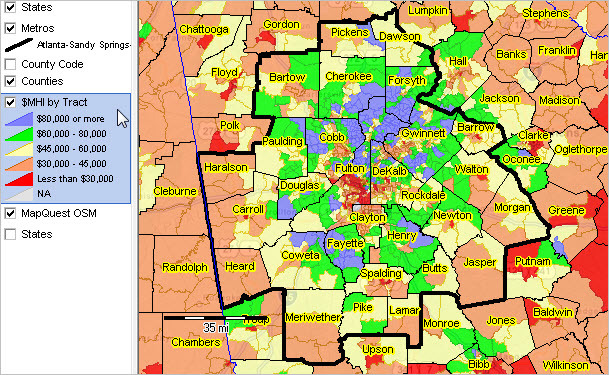 It is easy to see clusters of counties that are increasing or losing population and why. Counties increasing in population are shown by the dominant factor contributing to their growth — net migration or natural change (where births exceed deaths). Counties decreasing in population are shown by the dominant factor contributing to their population loss — net migration or natural change (where deaths exceed births). See more detail and access data via interactive table in the County Trends 2010-2015 section. Click graphic for larger view; expand browser window for best quality view. Click link below to view report. Data for all Appalachia counties, followed the regional summary, are provided table-by-table in the table sequence shown above. 1 – it is not used for commercial or consulting purposes. 2 – it is not used in funded research. — developed by ProximityOne based in part on Census Bureau data; http://proximityone.com/rda.htm. Use the RDA tool to develop reports like the one shown here for counties and regions of interest. Possibly more importantly, these resources can help us examine related topics such as healthcare and education. What are the characteristics and requirements now and how are needs, services and capabilities distributed across a region? How will the population change over the next several years and possibly result in improving – or deteriorating – conditions? Use the RDA demographic insights features and predictive analytics to better assess future change and needs. Contact ProximityOne (mention RDA in text section or call 888.364.7656) for more information about using the RDA resources or custom reports.